Each of my Sunday monthly classes at my house teaches a new technique.The technique last week started out to be the Black Ice Technique. 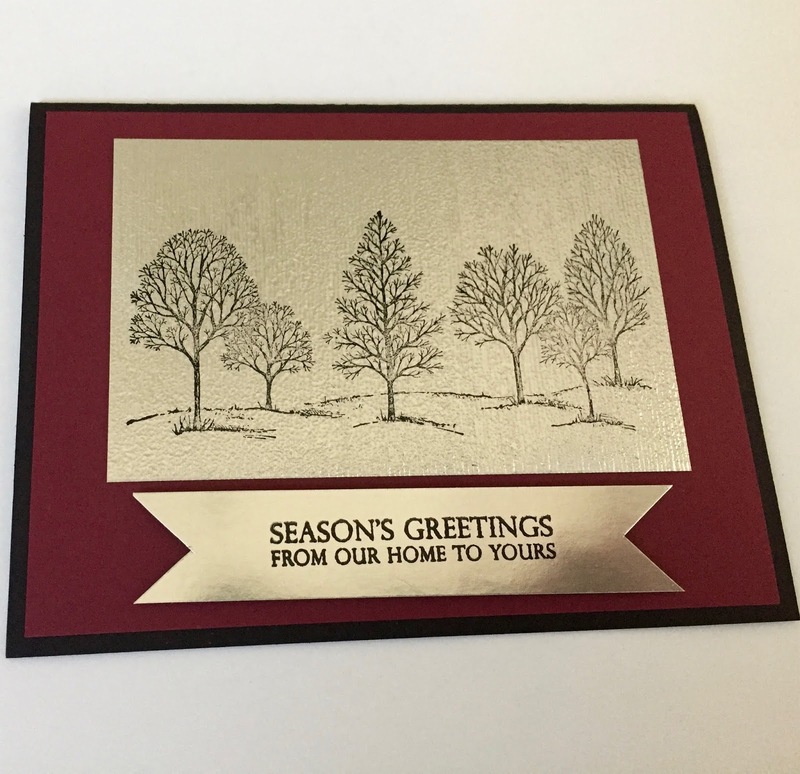 the silver embossed paper through the Big Shot using the Subtle Embossing Folder 143706. The folder gives the foil paper the texture that is very similar to the appearance of the dragged Black Stazon without the mess. You can see the difference of the 2 pieces of silver on the card. The words were only stamped in the Stazon and popped up. The silver trees were then mounted with Tear Tape placed on the new Merry Merlot yardstick and then onto a black card. The Lovely As A Tree stamp set and the worlds were from Merry Christmas to all #147702 it is also bundled with Thinlits #147912 from the holiday cattty. 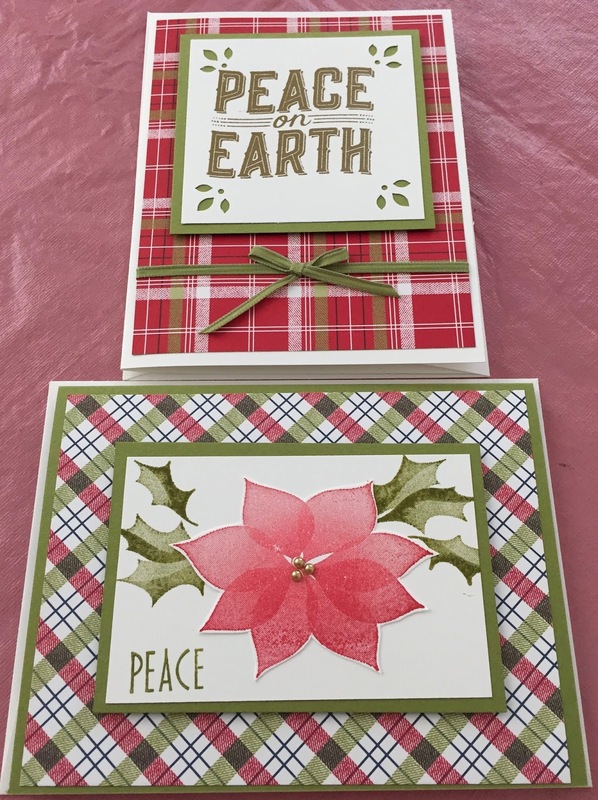 The Under the Mistletoe Designer Series Paper is the background of the 2 cards pictured. Love this paper ! 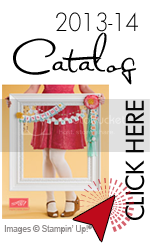 It works with ALL of the stamps displayed in the Under The Mistletoe Suite beginning on page 94 of the 2018-2019 catalog. The Poinsettia set is new this year and is gorgeous. " It is referred to in the the catty as " Dist Ink Tive " The detail in this stamp set is awesome.. It looks like it is a two stamp process but infact it is one stamp. 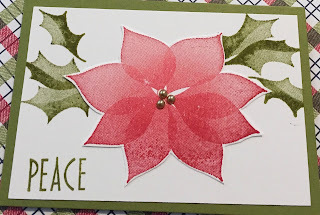 The flower is stamped in real red and the leaves in Old Olive. This 7 stamp set can be found on page 101. The ease of stamping these images and the detail that shows on the cardstock is amazing. 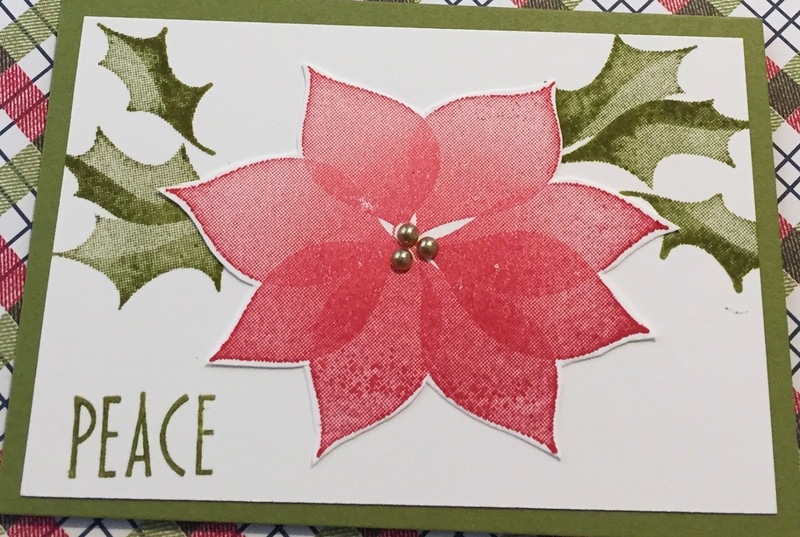 The center of the poinsettia has 3 Metallic Gold Pearls which are a new accessory and you can find on page 197. Each package has 121 pearls in gold and silver. The 3mm size is great for sending through the mail. 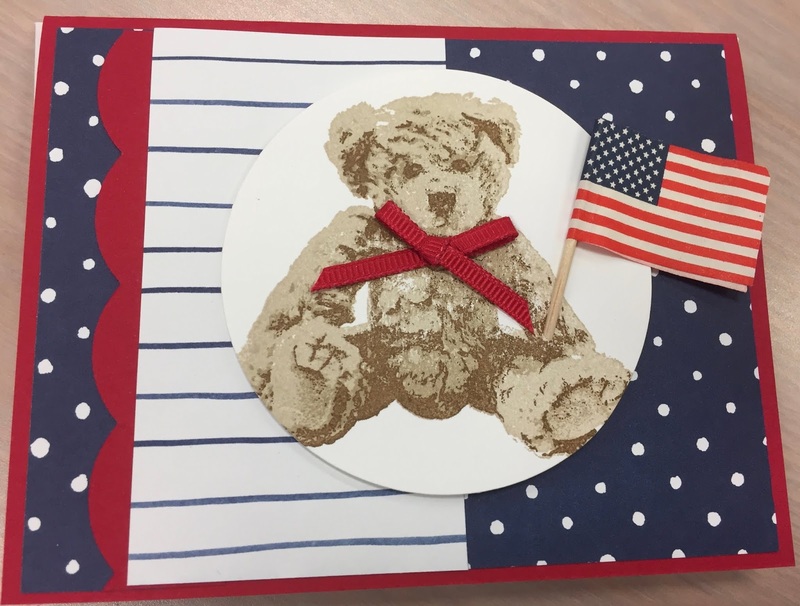 With the summer heat we are having stamping will keep you busy and you can be ahead of the holiday rush. Right now Stampin'Up is having a sale on the 11.00 Designer Papers. Buy 3 and Get 1 FREE through the end of the month. Don't miss getting 25% off. The pearls are 7.00 for 242 pieces. The above stamp set ,new in the 2018-2019 Stampin'Up catalog is becoming one of my favorites. The stamp set can be found on page 133. Along with the stamp set is a coordinated framelits die set. There are lovely words that are in a beautiful script. On the sailboat card the words from the Lilypad card are on the inside. I reversed the sayings on the other card. Both are so appropriate for several card choices we use frequently. The water was stamped in the new Balmy Blue on a piece of Tranquil Textures Designer Series Paper. Blender pens colored the bird and lily pad. 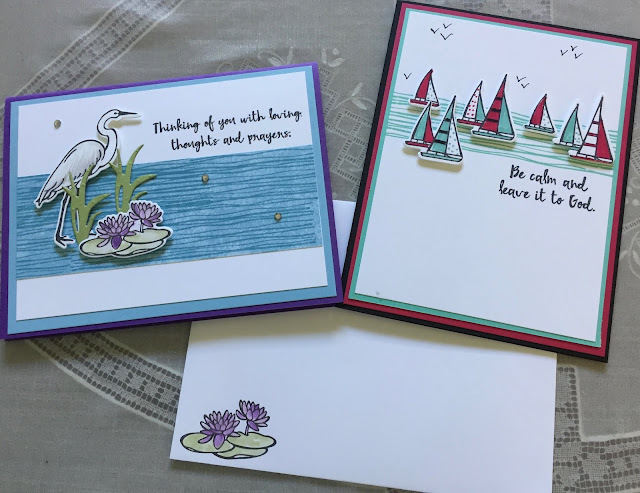 The sailboat water was stamped in Coastal Cabana and sailboats colored with our Stampin'Write Markers in Coastal Cabana and the new InColor Lovely Lipstick. This stamp set also has a " Congratulations " which with the above images would make a great travel or retirement card. The other two sayings are " To See Far is one thing ..." and " Going there is another." There are so many wonderful new stamp sets and dies in the catalog. Along with a revamp of colors and 5 awesome 2018-2020 InColors. 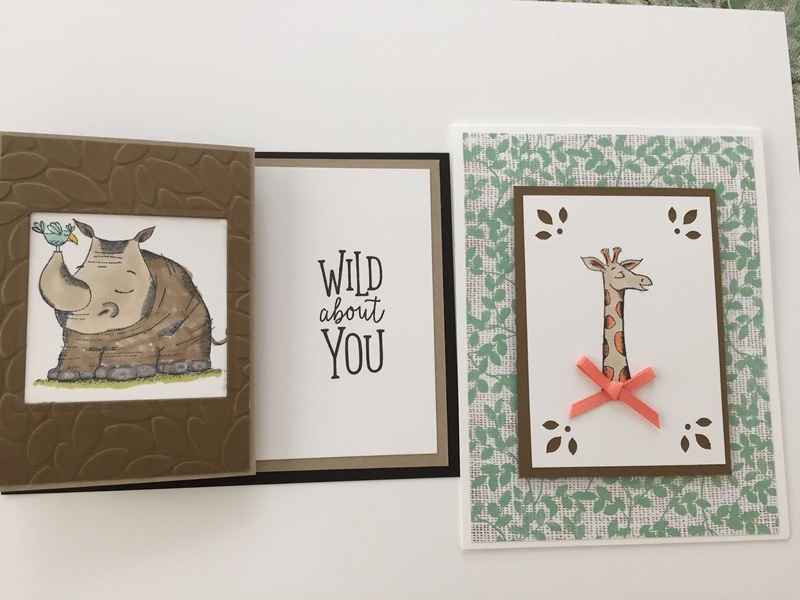 This is the perfect time to join the Stampin'Up family. 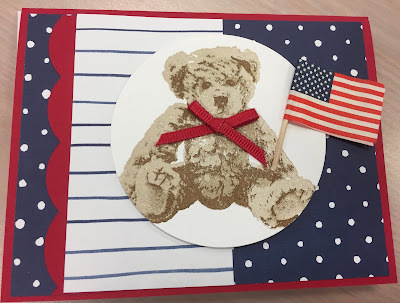 During July Stampin'Up is offering an additional 67.50 package of 10 stamp pads from one of the groups to the 99.00 of merchandise which is worth 125.00 in products. So. you can choose 224.00 of merchandise and you will only pay 99.00 which includes FREE SHIPPING. Ask me how and benefit from this awesome promotion that I can ever remember in my 12+ years of being a demonstrator. Also this month is the Designer Series Paper sale. Choose 4, 11.00 papers and only pay for 3. Join soon and you can get 30% off your first order. What a great time to pick-up the Designer Series Paper and the above stamp set and dies. cards with. Because of this I will be having all the retired colors on sale at my Open House on Sunday, May 27, from 1 to 4 pm. They are a real bargain at 3.00 for the Ink pad, reinker and SU marker. My retired stamps and dies are FREE with an order for the value from the new catalog. This year because of the date you can order from either of the catalogs and benefit from the FREE stamps . You can also on Sunday pick-up your FREE catalog with purchase.